We were drawn to Colmar, France by colorful photographs depicting fanciful scenes of half-timbered houses and quaint canals, both draped in blooming foliage. The weaving cobblestone lanes in the Old Town and cheerful Little Venice Colmar district seemed to be plucked straight from a fairytale – one that had to be seen to be believed. Now that we’ve been, we can attest to the fact that the town is as pretty as a picture. We had three full days in the city, which allowed us plenty of time to experience the best things to do in Colmar. Colmar is located in the Alsace region of France, which occupies the northeastern part of the country along the Rhine River (and German border), north of Switzerland. (Look at a Colmar map in Google Maps.) Known for its wine production, Alsace is dotted with picturesque towns and hillside vineyards. For us, to visit Colmar also meant visiting the region (which we were able to do by using public transportation and pedal power). Our list of Colmar things to do includes city, history, nature, cuisine…and a bit of exercise, too! Top Tip: Before you begin your Colmar sightseeing, stop by the Colmar Tourist Office for a Colmar city map and other useful information. Colmar Fun Fact: Artist Auguste Bartholdi – better known as the man who created the Statue of Liberty – was born in Colmar in 1834. As a Colmar claim-to-fame, Lady Liberty appears throughout the city. Old Town Colmar, France is the highlight of the city – and there are several ways to explore it! You can wander aimlessly, find sights by using a Colmar tourist map, ride the Colmar tourist train or follow the Tourist Trail. For our first stroll through town, we opted to follow the Tourist Trail to serve as a Self-Guided Colmar Walking Tour. The signposted trail leads visitors in a 6.1km loop around the city (estimated time: 2.5 hours). The route is outlined on the free Colmar Old Town Map from the tourist office, but a map isn’t necessary – we simply followed the golden triangles (embossed with Lady Liberty) to top Colmar sights. Each Colmar attraction featured a sign of relevant information providing a history of Colmar, France (in both French and English). Little Venice in Colmar is the most attractive part of the Old Town. The narrow and shallow Lauch River flows past brightly painted houses and under arching bridges. 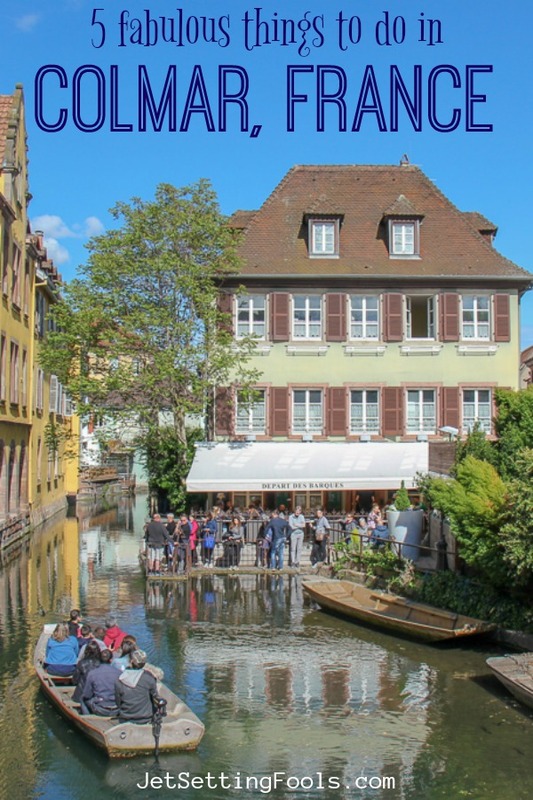 Taking a Colmar canal tour is the best way to see the impeccably decorated homes along the river. The impressive spire of St. Martin’s Church (or Collegiale Saint-Martin) can be seen from many points around town, but it’s worth a look up close – at both the ornate façade and the incredibly decorated interior. It should be noted, however, that the church is not officially a cathedral (as it is not the seat of the bishopric) and is only called such because of its massive size. Built in 1537, the lavishly decorated Renaissance-style Pfister house (or Maison Pfister) features paintings from the Bible, as well as German emperors. Dating to 1609, the façade of the House of Heads (or Maison de Tetes) is decorated with more than 100 head sculptures peering down at the onlookers. Once the center of business and politics, the Customs House (or Koifhus) was built in 1480. The ground floor served as a warehouse, market and customs office for hundreds of years. The beautiful brick and metal Market Hall dates to 1865 – and, after many other uses, is again a market today. The Tanner’s District dates to the 17th and 18th centuries – and is where tanners (people who tan animal hides) lived. Their tall, half-timbered houses were designed to allow animal pelts to hang and dry in the open air on the upper floors of the homes. Once home to fishermen, the Fishmonger’s District features a colorful rainbow of half-timbered houses along the Lauch River (which we think is the prettiest street in Colmar!). Tip: Want to learn the history of Colmar from a local guide? Book a 2-hour guided Colmar Walking Tour. Colmar – and dozens of other smaller towns – are situated along the foothills of the Vosges Mountains. The stunning vineyard and mountain landscapes of the region beg to be discovered on day trips from Colmar. Drivers can visit many of the quaint towns, which are linked together on the Alsace Wine Route. Without a car, however, we used the public bus and our own two feet to see more of the Alsace region. North of Colmar, the towns of Riquewihr, Hunawihr and Ribeauville are nestled along the Vosges among hillside vineyards. Each of these historic towns near Colmar, France boast a cluster of half-timbered houses and a church with a rising bell tower. The three towns are connected by a 5km path – allowing travelers without a car to take a hike through the vineyards from town to town. Mid-morning, we took a public bus from Colmar to Riquewihr. We walked the central cobblestone lane, stopping at Au Petite Delice for unbelievably delicious chocolate macaroons and diverting onto charming side streets. We exited the town through the Thieves’ Tower and set off on our jaunt through the vineyards. The path – which is also used by bikes and a few cars – steadily inclined through a forest and plateaued just outside the town of Hunawihr. From Hunawihr, we followed the path through budding vineyards, stopping often to take photos and enjoy the view. We found a picnic table under the shade of a tree where we ate our packed lunch (and macaroons!) with a view. As we completed our easy trek to Ribeauville, we could see hill-topping castles perched above the town we were walking to. Ribeauville, which is the largest of the three towns, is home to several winery tasting rooms. After our trek through the vineyards, we rewarded ourselves with a taste of the product. Much busier than the two previous towns we visited, we contently strolled the length of the Old Town before catching a bus back to Colmar. Buses 106 and 109 transport passengers from Colmar to Riquewihr and Ribeauville (and back). Tickets can be purchased from the driver and cost less than €4 each ticket each way. Request a bus schedule from the Colmar Tourist Info Office – and ask for an explanation of which buses are running on the day of your trip (not all buses on the schedule run year-round or all days of the week). There are no buses on Sundays. Also, ask them to mark the bus stops on a Colmar map. In Riquewihr stop at the Tourist Info Office (located on the main street) for a walking map, but note that the highlighted route does not go to Ribeauville, but the city is on the map (and continuing straight where the highlighted route turns back toward Hunawihr will get you to Ribeauville Old Town). While at the TI, pick up informative pamphlets on the towns, if you are interested in seeing the sights. From Ribeauville, it is possible to continue hiking to the castle remains in the hills, which we heard takes about an hour there and a little less coming back. 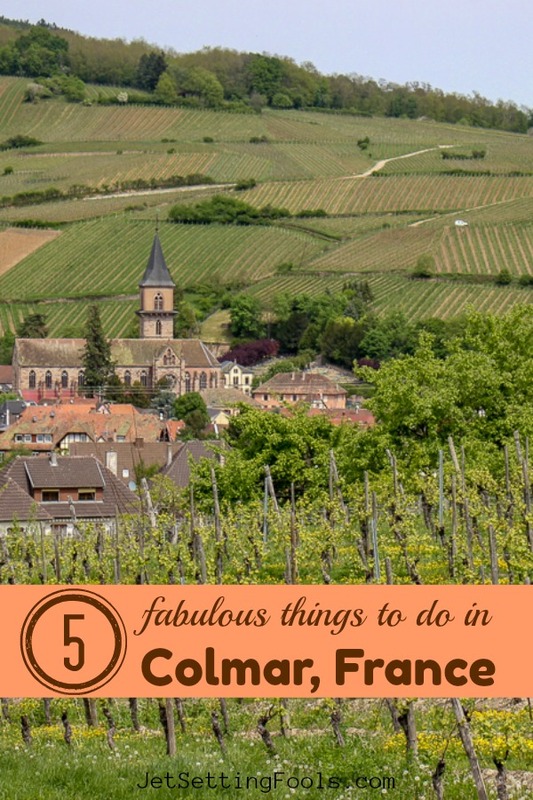 Day trips from Colmar, France are not limited to vehicle transportation – the town of Eguisheim, just southwest of Colmar, can be reached by bicycle! We pedaled our way from the Colmar train station along the river, through open fields to Eguisheim, another historic town in Alsace. It took less than an hour for us to navigate the route from Colmar to Eguisheim – and we stopped often to take photos. Once we arrived in Eguisheim, we locked up our bikes (just around the corner from the Tourist Info Office) and set off to explore. At the center of the Medieval village, which was awarded the ‘Favorite French Town’ award in 2013, is the Chateau Saint-Leon. From the central square (that the castle sits on), three ring roads encircle the town. We looped around the town on foot, marveling at the architecture and reading the history of the town on provided plaques. Biking is one of the popular Colmar activities and there are a few places to rent bikes in the city. We rented our bikes from Colmar Velo – Velodocteurs, which is located at the Colmar train station and rents bikes for as little as €6 for 5 hours. Ask for a free Colmar Cycling Map – and, if you are biking to Eguisheim, ask for the best route (which differed from the route we thought we would take). During our Colmar visit, the weather was incredible – sunny skies, but not too hot. It was perfect weather for dining al fresco. Throughout the Old Town, there are numerous Colmar restaurants that offer outdoor dining and feature local specialties. Craving something simple and light, we stumbled on Winstub La Krutenau in Little Venice. The riverside restaurant has only three food menu items – all of which are a variation of Tarte Flambee. The crispy, cheese-covered dish – similar to pizza – was exactly what we were looking for. However, after we had dined at a few places, we wanted to experience something different from restaurants in Colmar. In the morning, we headed to the Covered Market Halle for a little Colmar shopping. We perused the items for sale at the Colmar shops and started gathering items for a late afternoon picnic at Parc du Champ de Mars. At the shops, we found some of the best food in Colmar, France: Munster cheese with cumin spice, freshly baked baguettes and almond-stuffed olives. Tip: The Covered Market Halle has several restaurants, where you can dine before you shop! We started our Colmar shopping adventure with a quiche and fresh-squeezed orange juice at the small cafe in the center of the market. 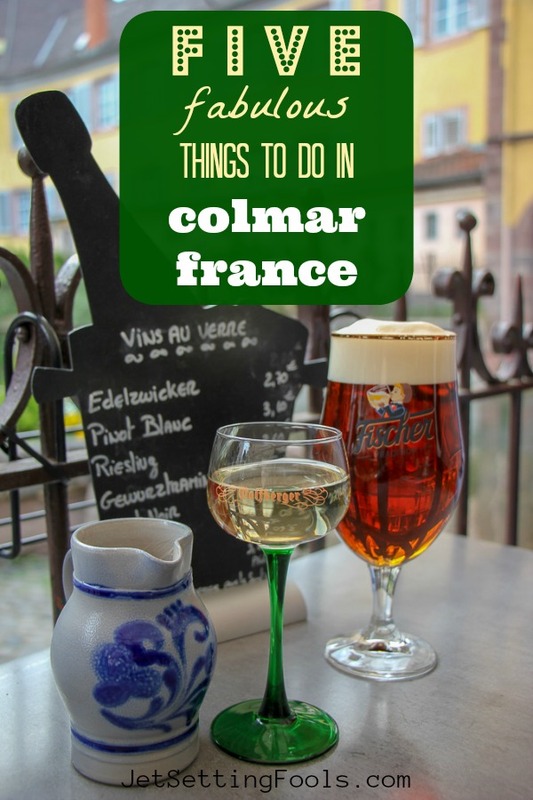 Need more ideas of where to eat in Colmar? Check out these reviews on TripAdvisor. Being smack in the middle of the Alsace Wine Region, drinking the locally produced wine should be on every Colmar itinerary! Most of the wine in Alsace is white, including varietals such as Riesling, Muscat, Pinot Gris and Gewurztraminer. Pinot Noir is the sole red wine in Alsace, however, it is quite pale in comparison to other Pinot Noirs. Local wine is available at every café and restaurant…and even the grocery store. After long days of sightseeing, finding a café in the Old Town where we could swirl and sip local wine was an ideal way to wind down the day. Top Tip: If you are planning to bring a few bottles home (who could resist?! ), make sure you pack your wine properly so it arrives safely home! Beer drinkers: don’t despair! While wine is certainly the most popular drink of choice in Colmar, they have beer, too! Our go-to spot for drinking beer in Colmar is Les 3 Singes (The Three Monkeys), where they offer a selection of craft beer on tap. There is one local craft brewer, Brasserie St. Cru, which is located about 4km north of the Old Town. Although we never made it to the brewery, we heard it was a fun spot for Colmar nightlife. Tip: Let a guide lead you through the Alsace wine region! Take a Full-Day or Half-Day Wine Tour and enjoy both the tastings and the scenery! 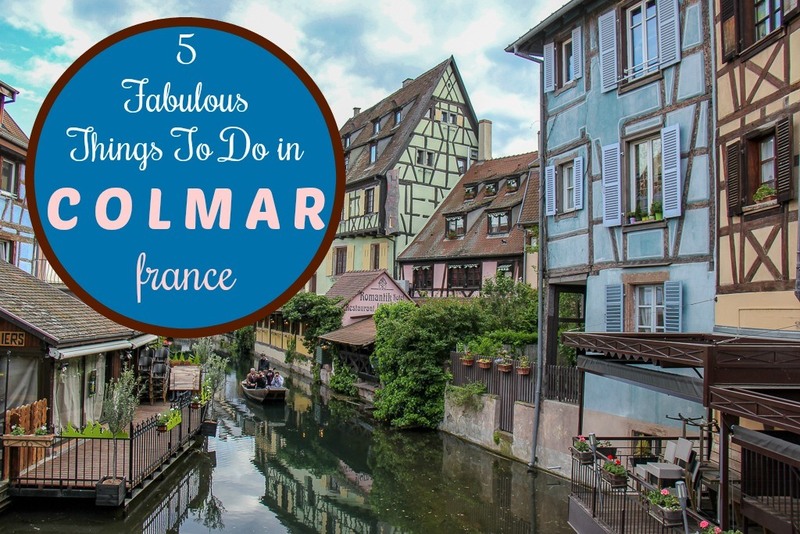 We have more tips for visiting Colmar – like day trips, where to stay, how to get there and what to pack! Gems of Alsace Day Tour – Explore the beautiful region with a professional guide – Book Now! The 4 Wonders of Alsace – Eguisheim, Ribeuville, Riquewihr and Kayserberg with a professional guide – Book Now! 3 Country Tour – Spend the day experiencing France, Germany and Switzerland with a professional guide – Book Now! There are many choices of accommodations in Colmar. We think the best places to stay in Colmar, France are in – or near – the city center. We stayed at the Ibis Budget Colmar Centre Ville, which we liked for the affordability and location (just a short walk from the Colmar train station, the Colmar Tourist Information Office and Old Town). However, there are many hotels in Old Town Colmar, France to choose from. Check out these highly-rated (by customer reviews!) hotels: James Boutique Hotel, La Maison des Tetes, Hotel Le Colombier Suites – or start your search on Booking.com, like we do! Colmar can be reached by train, bus or car. We arrived via train from Basel, Switzerland and departed via bus. There are several train and bus routes that service Colmar. In fact, it’s possible to travel by train on a Paris to Colmar day trip. Is Strasbourg, France also in your travel plans? We’ve got you covered with this post! Colmar is a walkable city…but only if you have the right shoes! Don’t forget to pack a pair of lightweight and comfortable walking shoes for your trip. I (Sarah) have traveled with these shoes by Columbia, Skechers and Reef. Kris prefers wearing these shoes by Merrell and Sanuk. Exploring more of France? Make sure to have a good guidebook before arriving. Start planning your trip to France! Search for the lowest airfares, the best accommodations and fun things to do…then start packing! Want more travel planning tips? Head over to our Travel Planning page for more information and tips on traveling – and for country-specific information, take a look at our Travel Guides page! 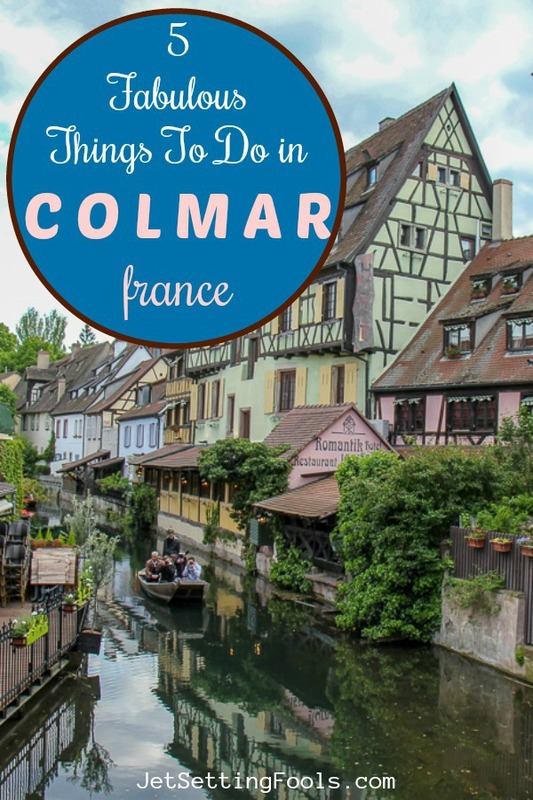 We want to know: What would you add to our list of things to do in Colmar, France? Give us your best tips and advice in the comments below! Ye iam still hear !! Hello Dean! Yes, the French certainly know how to live life. We’re doing great and trust you are well. Always great to hear from you!